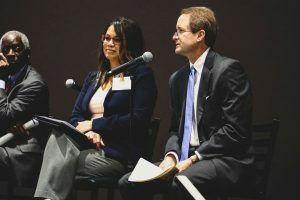 Ten at the Top recently hosted an event called “A Cleaner Future: A Look at Air Quality, Sustainability, and Energy Innovation in the Upstate,” which covered topics ranging from health issues to homebuilding to transporting groceries more sustainably. In the focus area of transportation, Maeve Mason and Landon Masters from the SC Office of Regulatory Staff Energy Office gave a presentation about their organization’s Transportation Fuel Action Tool—and if you’re scratching your head, wondering why the Energy Office is talking about transportation, Masters offers this statistic in answer: 29% of energy consumption in South Carolina is due to transportation (compared to 32% industrial use and only 22% residential). With that in mind, the Energy Office has a suite of tools and initiatives aimed at making that consumption more efficient—among them, the above-mentioned Transportation Fuel Action Tool, which helps companies and organizations that own fleets of vehicles to audit and analyze their fleet, factoring in intangibles such as public opinion, political will, economic development, and more, in order to inform decisions about a possible move to alternative fuel sources. Masters notes that in areas where electricity is generated by coal, making a shift to electric vehicles may not be much of a gain in terms of clean energy, but the tool takes that into consideration based on the user’s region. In partnership with the U.S. Department of Energy, there are also a variety of tools for individuals to make informed decisions about their fuel consumption, whether they’re buying a new or used car, wanting to find alternative fueling stations, or looking for information to read up on the subject. There are mobile tools as well for locating fueling stations and comparing fuel efficiency, emissions, and costs among different vehicles. As part of the Palmetto Clean Fuels coalition (PCF), Plug In SC is an initiative whose aim is to increase the adoption of electric vehicles (EVs) by making charging stations visible and easy to find, using signage, pavement markings, and designated parking spaces. It wasn’t enough to simply provide the charging stations, Masters says, because many times they were tucked away behind a concrete wall in a corner of a parking garage. True, EV drivers will find them because they need them, but part of making them visible is creating awareness in other drivers that charging stations are plentiful and accessible. A comprehensive state energy plan is in the works—a collaboration of stakeholders putting together a vision for the future of energy in the state and recommendations about what is needed to get there. One of those recommendations came from the transportation subcommittee: Lead by example, particularly when it comes to the adoption of alternative fuel sources and modes of transportation. 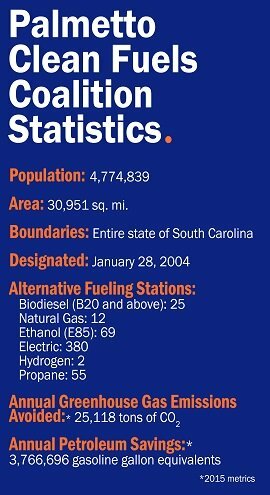 For more information about how your organization or you as an individual can conserve fuel, consider alternatives, and make an impact on South Carolina’s air quality, visit Palmetto Clean Fuels.org. 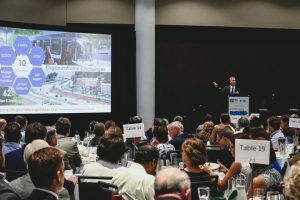 Last October, Ten at the Top and various stakeholders launched Connecting Our Future with a kickoff event that looked at the region’s transportation needs, where we’re going, and how best to get there. For the past several months, those stakeholders—individuals from public, private, and civic organizations ranging from freight, logistics, and industry to education and healthcare—have been working together to create a regional vision for transportation, mobility, and connectivity in the 10 counties of the Upstate. In March of this year, a Connecting Our Future idea exchange was convened to explore both issues and possible solutions (click here for the presentation from that forum), facilitated by consultant Stephen Stansbery of Kimley-Horn. Other team meetings have been happening regularly to keep momentum going and to allow coalition members to continue talking to one another. 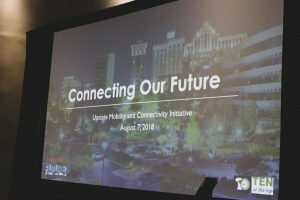 On Tuesday, a Public Rollout Event was held at the TD Convention Center with a group of more than 220 stakeholders–although Ten at the Top executive director Dean Hybl says he doesn’t want the term “rollout” to give anyone the impression that there’s a finished product and the work is done. Instead, he wants to change the way we think about implementation. “What we’re trying to do is to create a culture to enable projects, encouraging people to come together to solve problems instead of completing a project,” he says. Stansbury gave an unvarnished look at the challenges facing our region that will need to be addressed in working towards sustainable mobility. Among those, one of the biggest is that we are a very auto-dependent region, with only 2% of the population using some other means than a car to get where they need to go. Geographically, there isn’t much to restrict sprawling growth—and that growth is happening quickly, with Greenville being the 3rd fastest-growing community of its size in 2015–2016. Additionally, we are a freight-heavy region, not only being in the middle of the Charlotte-Atlanta corridor, but also being home to manufacturers whose products are destined for wide distribution and export. Perhaps the biggest challenge, though, is that the need is outpacing resources when it comes to addressing mobility issues, which means some out-of-the-box thinking is needed from individuals and groups who may not be used to working together. Representatives from three stakeholder groups—elected officials, workforce development, and energy—gave perspectives on ways that mobility issues impact us. Terence Roberts, now serving his fourth term as mayor of Anderson, talked about the lack of funding for public transportation and how it affects low-income individuals, relating the story of seeing four people waiting in 90-degree heat for a bus with their groceries, some of which must have been perishable. And seniors who don’t drive and don’t have family to drive them may miss medical appointments, which affects healthcare. “How do we serve those individuals?” he asked. Janice Moss, head of human resources for the staffing company redi-Group, addressed the challenges of finding and keeping qualified workers when there is a large group of untouched workers who don’t have access to transportation. Yes, we can recruit from out of state and bring workers in, but looking at the lack of public transportation to manufacturing facilities here in the Upstate would allow access to a wider group of workers who are already here—and that’s why redi-Group joined Connecting Our Future. Clark Gillespy, senior vice president of economic development at Duke Energy, painted two pictures, one of what is, and one of what could be. The first was all too familiar: You’re sitting in your gas/diesel powered car on I-85 between Pelham Road and the 385 interchange at 6:00 in the evening, with fender benders and brake lights as far as you can see. The pollution, lost productivity, wasted fuel, insurance claims, and general frustration don’t paint a pretty picture. In his second picture, though, the gas-powered cars have been replaced by electric vehicles; tractor trailers are in their own designated lane; self-driving cars make for fewer accidents; and the air is cleaner and quieter. Wrapping up the event, Leesa Owens of Michelin North America shared the story of how the world’s first automobile accident, involving one James Lambert of Ohio in 1891, spurred policymakers to start thinking about how to regulate this new technology—things like speed limits, brake lights, licenses, and safety features did not exist and needed to be created in order to keep the public safe as we plunged into the future of cars. To take a seat at the table, visit the Connecting Our Future website and find out more about how you can be involved. Have you ever wondered where you can find one source where you can search for fun outdoor activities without having to open a new page every time you search for something? Ten at the Top and Duke Energy bring you a quick and easy way to find outdoor resources in the ten counties of the Upstate using a virtual map with icons that you can easily sort by county or resource type. Each icon provides a description and address of the corresponding outdoor resource as well as multiple pictures so you can see what it looks like and get a feel for it before you go. The Nantahala Outdoor Center Chattooga Outpost is located in Oconee County and is a great outdoor activity for families. The Nantahala Outdoor Center has amazing whitewater rafting deals and hiking in great scenery on the western edge of the Upstate, near Walhalla. Southern Living called rafting the Chattooga River “the #1 thing every southerner ought to do.” Click here for scenic pictures captured from previous whitewater rafting events at the Chattooga River. The Walker Course is a prestigious golf course on the campus of Clemson University and is located on the borders of Oconee, Pickens, and Anderson Counties, but mostly in Oconee County. The Walker Course the home of the Clemson University 2003 NCAA national champion golf team and is a great way for friends and family to play golf in Clemson, South Carolina. The scenery is some of the best in South Carolina, whether you are teeing it up through the woods or on the water on the back nine. Click here to book your next tee time and tee it up where the former NCAA and PGA Tour Champions have before. The Spartanburg Science Center is a great center for school programs, children’s camps, birthday parties, and support sciences located in the center of the Spartanburg County. The Spartanburg Science Center offers hands-on learning for guests of all ages with live animal rooms, a museum room, and more than twenty-three exhibits. The live animal rooms feature all different kinds of reptiles, amphibians, and fish, while the museum room features fossils, bones, skulls, and rocks and minerals. The center is not technically an outdoor resource, but on a rainy day, you can head here to learn about nature in an indoor setting. The Diamond Hill Mine is a local mine located in Abbeville, South Carolina. The Diamond Hill Mine features many different kinds of crystals and minerals such as iron, amethyst, garnets, and several kinds of quartz, among others. This mine is very accommodating and is pet friendly—everyone loves a place where they can bring their pets! An added perk is that the mine allows guests to camp there for free. Click here to learn more about the crystals and minerals or to arrange for free camping with your pets. The Cherokee County Family YMCA Waterpark is a fun outdoor experience for the family located in Gaffney, South Carolina. Like most YMCAs, this YMCA offers many fun activities to get your body in shape for the summer: basketball courts, dance floors, T-Ball, summer camp, swimming, and many more fun activities for young children and adults. One thing this YMCA has that most YMCA’s don’t have is a waterpark. They also offer a summer volleyball camp at the end of July each year, which is taught by the head volleyball coach at Blacksburg High School. You can click here to see the membership offers, hours, and rates for the waterpark and entire YMCA.